Welcome to the Marilyn Gittell Digital Archive! 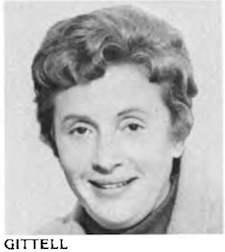 This digital archive honors Dr. Marilyn Gittell's contributions to the public school reform and community control movements of the 1960s, focusing on her scholarship about the people, politics and possibilities of educational justice in New York City. This website serves as a resource for Marilyn Gittell's scholarship on participation in education as well as her life and work more broadly. This archive is constructed from a selection of digitized materials from Marilyn's files that are related to her work as a scholar-activist. The site includes Marilyn's publications, original newspaper articles from the 1960-1990s, personal documents and links to ongoing activist-scholarship around the Ocean Hill-Brownsville conflict and other useful information. All items in this collection were found in Marilyn Gittell's files; all newspapers are original (with the exception of illegible photocopies which needed replacing) and any "handwriting" on items is original as well. Where any outside sources are referenced, this is made explicit. This online digital archives seeks to honor and disseminate the work of an eminent scholar-activist, to demonstrate her scholarship, involvement in educational justice reform movements and committment to social justice issues. Currently on display is a corresponding physical exhibit with items from this archive in the Mina Rees Library at the CUNY Graduate Center. The opening night event Tuesday, November 26, 2013 at 6pm in the Martin Segal Theatre at the CUNY Graduate Center. This website, which is the permanent online component of the physical exhibition, was created and is maintained by Critical Social Personality doctoral student Kimberly Belmonte with the support of the CUNY New Media Lab and the contributions of our project collaborators. This web resource is part of a larger collaborative archive project with Rachel Liebert and Wen Liu, both doctoral students in Critical Social/Personality Psychology. Our archival journey began with 250 boxes of Marilyn's academic files in a storage unit in Long Island City. Our first step was to fully re-organize the storage unit, while simultaneously undertaking a ‘surface’ coding of all the boxes. In doing so, we assessed and prioritized which boxes were most likely to contain material relating to the proposed exhibitions – e.g., that relating to Ocean Hill-Brownsville, community control, school reform, decentralization, and/or educational justice in general). From there, we began to systematically sort through boxes that seemed most pertinent and pull out the specific materials that connect to the exhibitions. We then moved approximately 30 boxes to the Graduate Center for further evaluation, digitizing, and cataloging. From these boxes, we selected the materials displayed in the physical exhibit and on this website. Now, please have a browse through the collections or click through the exhibits to see a sampling of Marilyn's scholarship on reform in public education.